The diamond jubilee logo will take inspiration from the iconic plaques of the players enshrined in the Hall of Fame's location in Cooperstown. The design for this logo includes the Hall of Fame symbol, which is inlaid with bronze of a big facet-cut “75”, along with a diamond baseball bordered between the years 1939 and 2014. This design is filled with laurels to denote the honor that comes with earning a place at the Hall of Fame. This new logo is to be used by the organization as it starts celebrations for the 74th anniversary and steps into the 75th year of its existence. To honor the diamond anniversary, the Hall of Fame will organize a variety of special events during next year's summer to coincide with the museums opening on June 12, 1939. The president of the museum, Jeff Idelson, was present at the unveiling and told that the organization is entering its 75th year by giving the starting pitch in their diamond salute. He also commented that this unveiling was the first among many to be announced during the coming months to mark the diamond anniversary of one of America's most respected baseball destinations. The Hall of Fame Weekend is planned to be held in Cooperstown from July 26th to 29th. This event will feature the induction for players who have earned their election from Expansion Era Committee Voting that is to be announced on December 9th this year. Also the players elected through the Baseball Writers' Association will be inducted, and the list will be announced in January next year. The US Mint is also commemorating this event by releasing special Commemorative Coins in 2014. These coins will be made available for buying to honor the historic event in American life. 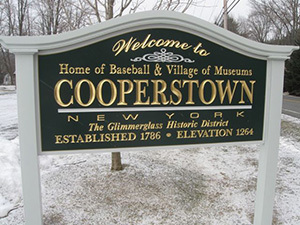 In 1939, the museum had initiated the ceremony to commemorate the 100th anniversary of the alleged “first game” of baseball played in Cooperstown in June 1839. On June 12 1939, the first 4 classes of the electees to the Hall of Fame were honored, as the process of electing players had begun three years back in 1936. LGH19 Productions has also announced the details of a music event to be held at the same stage as the induction ceremony and after 6 days of the ceremony for the Hall of Famers on August 2nd, 2014. The live event will likely have an assortment of the biggest names in the music industry, along with various celebrities from fields like television, baseball, and film. The event will be held at the Clark Sports Center ground to benefit the Hall of Fame. Some of the music guests featuring in the event will include Boston Pops Orchestra, which will be the evening's house band.